Within 250 miles of Carroll, IA. Did you know that the STREAMLINE after the start and turn is the absolute fastest that Olympic swimmers are going during any race? Many very good competitive swimmers unfortunately, however have “breaks” in their streamline that actually slow them down. 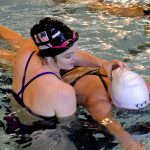 At this clinic participants will learn to maximize the momentum generated on each start and turn from USA Olympic Coach – and Age Group Coach to Missy Franklin – Todd Schmitz. SAVE Take advantage of early bird pricing – Prices will rise as the clinic gets closer! Trusting your streamline and dolphin kicking underwater is absolutely, undeniably, the fastest way to move through the water! Whether you dolphin kick on your stomach, side or back, understanding the importance of streamlined, underwater speed is vital for every swimmer! 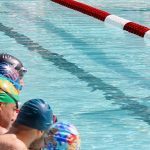 Olympic Coach Todd Schmitz will teach you how to make the most of your streamline, underwater kicking, and breakout, as well as teach you drills on how to improve upon those skills. Streamlines: Trusting your streamline and staying tight from fingertips to toes and head in line with your spine, is the simplest way to maintain speed. Todd will reinforce to you why swimmers should NEVER take streamlining for granted so that they can maximize their momentum off of every start and every turn! Underwater Dolphin Kicking: Too many swimmers only kick from their knees down, but a good dolphin kick should begin with a chest press and whip through a swimmer's body. Your swimmer will learn to use their core for more speed and power with every dolphin kick. Breakouts: Transitioning from being underwater to swimming takes skill and patience! Your swimmer will learn how to remain streamlined, keep their head down, and explode into their first stroke. A few small adjustments at this key point in every lap will make a big difference in your swimmer's times! Swimmers and parents are invited to ask Coach Todd questions during a Q&A session. Gain insight into his training regimen, diet and nutrition, and recovery tactics that he teaches his swimmers. Take a photo with Coach Todd, get autographs, and receive a special gift from our sponsors!